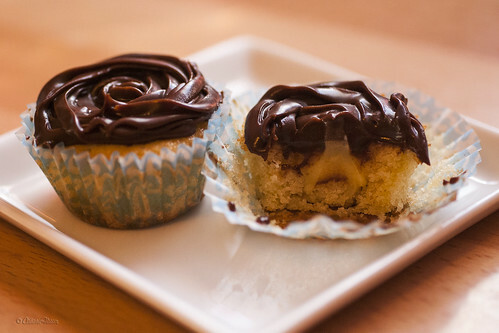 Boston cream pie (-ish) mini-cupcakes | SMØRGÅSBORD! I have a confession to make… I made a slight error in my previous post on Brazo de Mercedes 😔 I made too much of the custard—that, or I failed to make enough room for the filling in the center while I was piping the meringue. In any case, I was left with enough custard to fill another batch of BdM cupcakes! I didn’t want to make another batch of meringues (because what would I do with the 6 egg yolks I would not be using? ), and I didn’t want to throw the excess custard filling either (I hate wasting food)… So I ended up placing the thing in a tightly sealed container and stored it in the fridge until I can figure out what to do with it. Then yesterday morning, it just hit me: BdM’s custard filling is basically the same as the crème pâtissière used to fill so many desserts like eclairs, cannoli, and cream puffs (just to name a few)… The only difference is that the custard filling is thicker and firmer in consistency than the crème pâtissière due to its use of sweetened condensed milk vis-a-vis the latter’s use of plain milk with a bit of sugar and corn starch. So why not use it as a substitute? Pre-heat oven to 180°C and and line your cupcake pans with paper cupcake liners. In the bowl of an electric mixer, cream together the butter and sugar at medium-high speed until light and fluffy. Add the vanilla extract, then continue beating. Turn the speed to «high» and add the eggs one at a time, beating until well-blended. In a separate small bowl, mix and sift together the flour, baking powder, and salt. Set aside. Beat at high speed until the batter becomes smooth. Fill each prepared cupcake liner 2/3-3/4 full with the batter. Bake in the pre-heated oven for 10-14 minutes (18-25 minutes for standard cupcakes), or until a toothpick inserted near the center comes out clean. Like indicated above, I used the excess custard filling from last week’s BdM cupcakes, just whisking in about 3 tablespoons of milk to loosen the consistency and make it more like a crème pâtissière. Anyway, I’m including here the original recipe for crème pâtissière that went with the cake recipe above. In a medium bowl, thoroughly beat the egg yolks. Gradually stir in the milk until well-blended. Set aside. In a large saucepan set over medium-low heat, mix together the sugar, cornstarch, and salt. Gradually add the egg-milk mixture, stirring constantly to prevent lumps. Continue cooking over medium heat, stirring constantly, until the mixture reaches a low boil. Allow to boil for one minute, still stirring constantly, then remove from the heat. Place the saucepan in a bowl of ice water and continue stirring. When the mixture has cooled down a bit, stir in the vanilla extract. Cover with clingfilm (to prevent a layer of skin from forming) and refrigerate until ready to use. Place the chocolate chips in a medium bowl (with a capacity of at least 500 ml). Set aside. Place the heavy cream in a saucepan set over medium heat, and bring to a simmer, stirring constantly. As soon as the cream starts simmering, remove from heat and pour over the chocolate chips. Make sure all the morsels are covered with cream. Cover the bowl with a lid, and let sit for about 5 minutes. After about 5 minutes, remove the lid and stir/whisk the mixture until smooth and velvety. Cover once again and refrigerate for about 3 hours, or until the ganache has thickened into a piping consistency. When the ganache is ready for piping, spoon it into a piping bag fitted with your favorite nozzle (I used a Wilton #129). 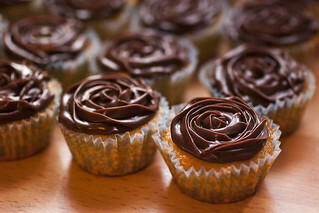 Next, frost the cupcakes by piping rosettes on top with the chocolate ganache. Alternatively: prepare the cupcakes (make the hole, and pipe in the filling) before making the ganache. 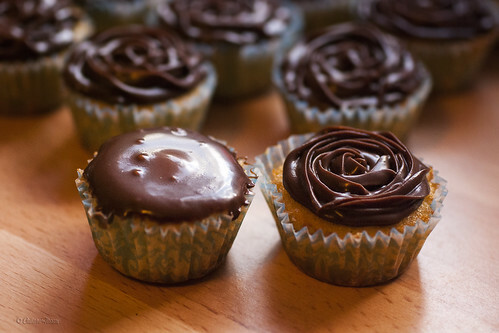 Then, as soon as the ganache is ready (right after whisking it until smooth and velvety), skip the refrigeration part and just dip the top of the prepared cupcakes in the ganache.